If you have lost a loved one, or even know someone who has, you have probably heard about the much-touted “5 Stages of Grief.” If you are one of the many who simply have not (or did not) go through these stages, you are not alone. The truth is the theories behind these specific stages are just that – theories. Their validity was never truly tested, and the actual basis for the stages was in relation to terminally ill cancer patients, not those who had actually lost a loved one. While there may be some similarities from person to person when experiencing grief, there is no set way that all people grieve. Grief counsellors are all in agreement that grief is a personal experience. The belief that a person who has just lost a loved one must be outwardly upset, and depressed for an extended period is just not true. Some people may show their grief in these ways, but others may go for an extended period without ever really feeling anything. The manner in which you experience grief is personal to you, and your temperament and personality are the key players in determining how you handle your loss. There are several different types of grief personality types, and each manner of experiencing grief is completely normal to that person. It often seems as if the amount of grief should be dependent on your relationship with the deceased. However, some people experience the same types of emotions for each loved one that passes on. Again, this is a normal aspect of grief personality types, and is responsible for the wide ranges of reactions that can occur within a family when a loved one dies. Understanding the various grief personalities, as well as the fact that all people grieve differently, will help you deal with these reactions to death, and help you avoid the hurt feelings and misunderstood expectations among those that are dealing with the loss. Some people experience the emotions of grief with nearly every fiber of their being. This personality type often feels the entire range of emotions, including depression, anger, anxiety, denial, loneliness, shock, and confusion. These people often jump back and forth through these emotions, and often have a very difficult time dealing with the pain they experience as a result of their loss. People with this grief personality typically need the help of others to help them get through their loss, as they often find it difficult to carry on with their normal everyday activities. Grief counsellors, support groups, and church or family members are often beneficial in helping them learn how to deal with their grief. This type of mourner often choose to intellectualize their grief by seeking out information, and looking for ways that can help solve problems and issues that are going on around them. These people are generally strong in the face of emotions of any type, and may seem as if they are detached or dispassionate when compared with the reactions of those around them. This personality often jumps into physical tasks and projects, or even a particular sport in order to deal with their grief. Instrumental grief often leads to a person appearing cold, or lacking emotions to others. However, they still go through their own grieving process. The difference is, this type of personality internalizes their emotions rather than allowing others to see their reactions to their grief. There are also that choose to preserve their loved one’s memory in as many ways as possible. They may create shrines, or write poetry and music as a way of immortalizing their loved one. These people often create scholarships or foundations that will ensure that their loved one is never forgotten. This personality may feel extreme emotions due to their loss, but strive to portray themselves to others as being untouched by their grief. This creates a dissonance between what the person is feeling, and how they choose to show those emotions to others, leading to general feelings of conflict within themselves. This personality is often much more likely to feel as if they are not feeling the “right” emotions, which often leads to feelings of intense guilt as they try to understand why they cannot show the same emotions as those around them. Seekers are those who search for religious or spiritual comfort in dealing with their grief. These people may renew or discover their interest in attending church, or may begin to seek out other spiritual methods to help them find meaning in their own lives. This personality often chooses to seek their comfort in these avenues, while seeming to ignore the grief of those around them. Normalizers use their grief in a positive way by trying to renew their relationships with family and friends. This personality often uses their loss as a reason to reconnect with those who have grown distant, or with those whom they have broken off all ties. People with this type of personality may also choose to get involved with their community or church. All of these reactions are basically a way of helping them deal with their loss and the resultant loneliness. For some, grief acts as a catalyst to push them towards making a difference for others. This personality type seems to find more meaning in their life after losing a loved one, which pushes them to create awareness organizations or groups that allow them to help others who have lost someone they love. Activist mourners are responsible for the development of a wide range of organizations that raise awareness for different illnesses, research, or drunk driving. It is also important to understand that men, women, and children all experience grief in different ways. Society has created many “rules” that pertain to how the different sexes should act, and these social pressures also affect how a person chooses to show their grief. Men, for example, are often told that they have to be the strong ones – tears are a sign of weakness, so some men may only allow their grief out when they are alone in order to maintain their appearance of strength. Women in society are taught the opposite. It is expected that they cry and show their emotions; however, this is also not how all women deal with their grief. For those who choose not to show their emotions, they are often vilified, or viewed as being cold and heartless. None of these things are true, but societal pressures often make grief more difficult to deal with. Children are the least equipped to deal with loss, especially of a loved one. Their reactions depend on their emotional development, as well as their cognition of what is truly going on around them. Younger children may fluctuate between sadness, anger, loss, or confusion, and their emotions may seem extreme. There is nothing wrong with these reactions, and care needs to be taken to be there for the child, regardless of whether they are showing their emotions or not. Death is a confusing time for children, and they need their caretakers more than ever during their grieving process. Throughout the grieving process, most people experience varying intensities in their emotions. There are no set time frames or steps in this intensity, and people may experience them in different ways and time frames. The initial shock of loss often leads to feelings of denial or disbelief, even for those losing someone to a terminal illness or other “expected” death. Still others may feel a sense of numbness or lack of emotion. After the initial shock of losing a loved one, some people may experience an intense period of depression, or feel as if the true meaning of the loss finally “hits” them. These emotions may lead to reflection on their relationship with the deceased, and how their loss will truly affect their lives. There are many myths surrounding grief, and it is important for you to understand that these beliefs are simply not true. They may be the normal response for some people, while others never experience them. Again, this is all a part of the personal experiences of grief. This myth about grief just may be the most untrue of all. If you have ever been to a funeral service, you already know that there may be plenty of laughter and smiling from those in attendance. Funerals are a celebration of life, which means that many people are sharing their favourite memories and experiences about their loved one. This sharing and recollection often leads to laughter and even joy, which often spreads to others around them. Laughter is contagious, and it truly makes people feel better, especially when they are dealing with their grief. This is another myth that may be difficult to understand in the period right after someone dies. When you are initially dealing with your loss, it is very common to feel as if you will never get over your loved one’s death. However, most people find that they are much more resilient than they initially thought. While the feelings of pain associated with the loss are quite intense, and may continue for a long time, most people are still able to carry on with their lives after only a few months. Depression, anxiety, and anger are all parts of intense grief, and these feelings do subside over time. It is important to remember that even though these intense emotions ease, you will always carry your memories and thoughts of the loved one with you forever. There is no right or wrong way of coping with the loss of a loved one. As long as you are not bringing harm to yourself or others, whatever helps you cope with the loss is ok. People react to grief in different ways, and the coping process is no different. It is perfectly normal to try to find the positives of the death, rather than focusing solely on the negatives. It is a given that those who are dealing with death are saddened, but if sitting around by yourself in tears is not helping you cope, there is no reason for you to do it. Many people turn to comedy or other outlets as coping mechanisms, while others find it cathartic to start writing or journalling about their feelings. Some people feel that talking about their feelings, or about their loved one, helps to deal with the emotions. There are even those who turn to exercise, meditation, and even video games to help them with the coping process. The important thing is, if it makes you feel better, it is perfectly acceptable. 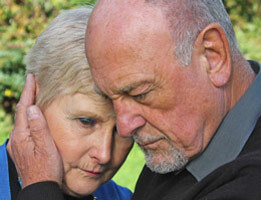 Many people wonder if they should seek counselling when they are dealing with grief. While there are some people who do benefit from it, numerous studies have shown that those dealing with normal grief often find that it makes the emotional impact worse. Counselling is best reserved for those who are truly unable to deal with their emotions and loss, the effects of which are causing serious problems in their daily lives. However, searching out support from family, friends, or support groups has been proven to be beneficial for all of those who are dealing with grief. When it comes to dealing with grief, and coping with the loss of a loved one, the key is to understand that everyone is affected in different ways. Instead of trying to focus on whether you or those around you are expressing your grief in appropriate ways, understand that everyone is different, and what works for one person may not work for another. Just as your relationship with your loved one was unique, your grief is as well.